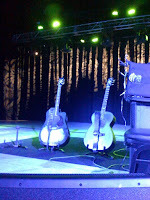 My wife and I had the pleasure of attending last night's show at Minglewood Hall in Memphis, TN by acoustic guitar genius, Tommy Emmanuel. This guy is simply amazing and has to be seen and heard to be believed! He ran through most of his classic songs and played them all to perfection. I heard not one mistake the whole night... it is truly amazing to see such virtuosity up close like that (we had front row seats) and in such an intimate setting. My favorite tune of the night was Tommy's rendition of "Somewhere Over the Rainbow"... awe inspiring, to say the least. He starts the tune with a cascade of right-hand, finger plucked harmonics and plays the song with the most beautiful voice leading I've ever heard. Truly something special to experience. Check out this YouTube video of another live performance of "Somewhere Over the Rainbow" to see what I mean. The man is a genius!